As you know, if you read this blog often, when we have friends or family over to visit in winter, we’re quite partial to a little drive up into the mountains beyond Üzümlü to Kırkpınar. This is especially fun in the winter months because you can sometimes be thigh-deep in snow. The restaurant’s signposted and we were in the right place – but it all looked so different. Familiar is grey, snow-heavy skies, ice, slush, bare black tree barks and branches contrasted against the brilliant white of the snow on the ground and mountainsides. On this day, we had crystal clear blue skies, dusty rubble tracks and the vibrant green of pine needles clinging to the trees. We’d warned t-shirt-wearing dad how high and cold it is up here – and then arrived to this! So here we were on a weekday in winter in a remote mountain village. Not a soul around and a restaurant that looked like it hadn’t been open for months; garden picnic tables stacked high and köşks stripped of their cushioned seating. We marched off up the hill to check out the wooden building and were greeted by a barking dog; the only sign of life. But that sign of life, in turn, brought out a guy in jeans and Wellington boots. Time for Barry to put his best Turkish on. “Of course,” he replied in a why-wouldn’t-we-be kind of way. Even when somewhere looks derelict and closed in Turkey, it’s always worth a go! “Great. Have you got lamb tandır?” We’ve heard they do a good tandır at Kırkpınar Restaurant and my dad loves the stuff so it seemed a safe bet. We relayed the translated information back to my dad and his friend, explained what kavurma is and we all agreed that on a warm, sunny winter’s day in the mountains, kavurma sounded like a good option. We looked inside – a huge wood burning stove was roaring away…but my dad was in his t-shirt and loving the mountain air. A table was quickly set up in the sunshine on the terrace and, at that time of day, all was toasty. Ahh, in a country that is charging through its modernisation process it’s still such a treat to be able to enjoy having places like Kırkpınar Restaurant around. Ice-cold mountain spring water continually tumbling into a well housing bobbing bottles of fizzy soft drinks and beer. That was the refrigeration process of that day, at least! As we took our seats, our welly-clad waiter appeared with a jug, filled it with water from the spring and placed it on the table. “Shall I bring you some starters and a salad, too,” he asked. We knew Kırkpınar Restaurant was famous for its homemade village bread (köy ekmeği) so, as bread-lovers, we were already gleeful when four big, red hot ‘loaves’ were placed on the table. Then came rock hard, homemade butter; a bowl of homemade süzme yoghurt; homemade jam and hard crumbled cheese (not in shot). Yeah, think we got a a little selection of some of their Turkish village breakfast ingredients there, but we weren’t complaining. We tore into the hot bread; crusty on the outside and so soft and light in the centre. Slithers of butter slowly melted into the bread as we then dolloped mixtures and combinations of jam, yoghurt and cheese. Simple food that we couldn’t get enough of. What Turkey does best! “We’ve not asked the prices for any of this,” we mumbled through mouthfuls of bread. By and by, the salad arrived along with bottles of olive oil and nar ekşisi (a sour pomegranate sauce) for dressing. A salad for four people to be shared between two of us – our company for that day don’t do salad. They were waiting for the meat and were more than happy with their simple starters. Just one big saç filled with meat! Now here was a dad-pleaser if ever there was one. All four of us had ordered the kavurma so it had all been cooked together in one big saç (a large shallow pan) and served straight to the table. Çoban Kavurması – loads of sautéed lamb or beef (beef in our case) with onion and pepper. We’ve got the salad, yoghurt, cheese, four new hot loaves and homemade butter. And we all tucked in. No gristle or fat on the meat. Simple, easy food that we all made pretty short work of in a devouring kind of fashion. The loaves that had arrived, both me and Barry said we wouldn’t eat ours. We were already comfortably full from the starter! Hmm, well that time comes when you’ve got olive oil/nar ekşisi/fresh lemon salad juices left on your salad plate, you’ve got juices from your kavurma and you’ve still got bits of yoghurt, butter and cheese left over. Aaaarrggh, fresh homemade bread…dips… We’d almost finished our cobs by the time the waiter came to clear our table! We accepted the offer of Turkish coffee, regular coffee and çay – and I went off to take a couple of photos around Kırkpınar Restaurant while we waited. Reasons: I take lots of photos, I was trying to get my bearings in a non-snowy setting, we’d eaten loads! The house in the background of this photo is the same building in our previous post about the village of Kırkpınar (link above in first paragraph). Lovely to see the difference! Bread and water and hot drinks in the price. Just over £4 per head for a proper feast of dad-pleasing delicious Turkish village homemade food…and dad-pleasing prices, too. And yeah, don’t worry, we also made sure he got his lamb tandır fix a couple of days later at Cin Bal, too. As for 2015 and special moments,though…you’re right up there, Kırkpınar Restaurant. 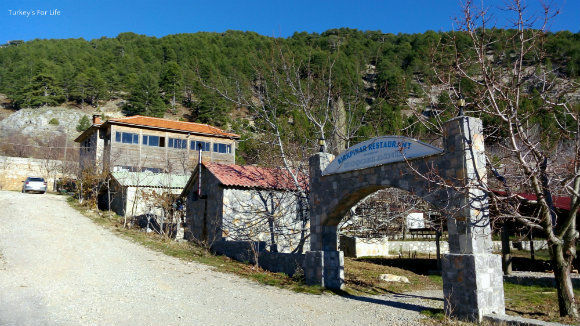 Kırkpınar Restaurant is on the main Fethiye-Çameli road and is clearly signposted. Head towards Üzümlü from Fethiye and then continue along the road signposted towards Çameli and, eventually, Denizli. You will come to some snow-depth poles at either side of the road and the restaurant is just off to the right. Kirkpınar Restaurant is open daily, all year round – kuzu tandır (lamb tandır) is served on Sundays (winter 2015-16). They also serve Turkish village breakfast (köy kahvaltası). If you’re heading up to Kırkpınar Restaurant in winter, please check mountain weather conditions before you leave. This is a zone for snow chains and conditions can change quickly! On a clear day, however, happy days! If you’re heading up there in summer, relish the cooler air after sweltering at sea level. For other ideas of where to eat and drink around the Fethiye area, visit our local Fethiye restaurants and bars page.